Why use our survey team? Who are our surveyors and what do they do? Gannett Fleming’s highly-trained and experienced engineering surveyors provide in-house surveying and mapping for all types of planning and engineering projects. With engineering backgrounds, our surveyors know the key data that you need to get it right the first time. The team’s multidisciplinary expertise combined with the latest technology and a wide range of geospatial solutions are their greatest strengths. Using advanced techniques and the most cutting-edge equipment, our surveyors provide fast, highly accurate, cost-effective surveys in virtually any terrain. This gives project managers the key data and end products they need to make fast, informed decisions. To view and download a printable pamphlet with more information on our in-house surveying capabilities. Our survey team uses Leica GeoSystem Survey Grade GPS equipment to set control for aerial mapping projects, civil design projects and construction sites. We also use this equipment, with its RTK capabilities to perform topographic site mapping, construction stakeout, wetland delineation, and GIS data collection. This equipment is capable of producing subcentimeter precision. Leica total station surveying equipment is also used, capable of producing subcentimeter accuracy, with several instruments that are annually manufacturer certified to produce National Geodetic Survey (NGS) control survey accuracy. Some of these instruments have reflectorless and/or robotic capabilities. Leica GeoMos monitoring software is used to provide incremental or continuous, round the clock, structure movement monitoring when connected to a robotic total station. Our survey team also uses conventional automatic levels, as well as, Leica electronic digital levels that scan barcoded rods to produce sub one-hundredth foot accuracy vertical control and structure movement monitoring. 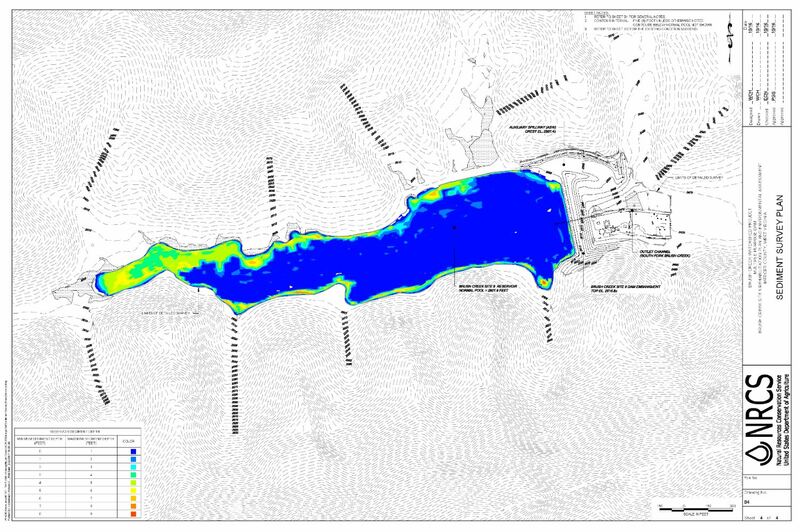 Bathymetric equipment includes Seafloor Systems Hydrolite TM Single and Dual Frequency sonar equipment linked to survey grade GPS units to perform bathymetric surveys in lakes and rivers. The dual frequency echosounder is able to penetrate through soft sediments to detect hard layers, thus producing a top-of-sediment and approximate bottom-of-sediment elevation. A recent addition is a DJI Phantom 4 Drone, used to create high-accuracy orthoimagery, and an additional means to create topographic surfaces. Why use our survey team for your project? Will travel anywhere in the U.S.
Sediment Survey Plan created using a combination of Dual Frequency Echosounder and sediment probing for NRCS on Brush Creek Site 9 in West Virginia. 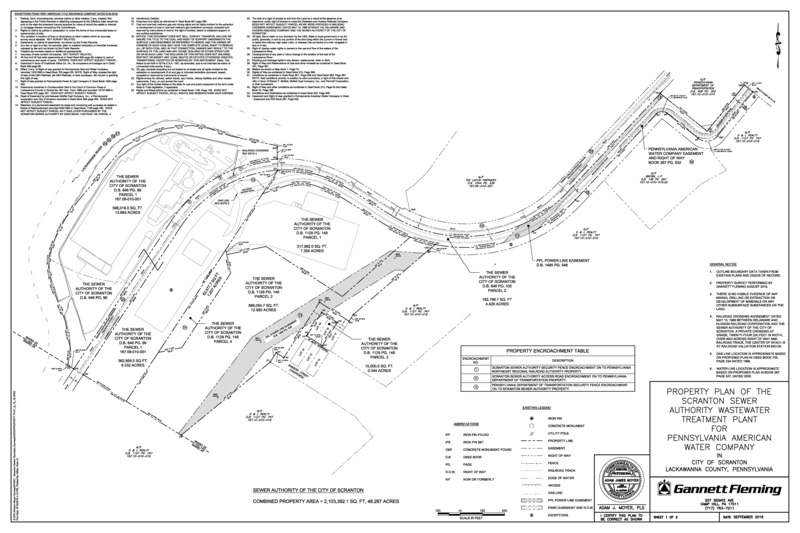 Property Plan of the Scranton Sewer Authority Wastewater Treatment Plant for Pennsylvania American Water Company in Scranton, PA.
Robotic surveying technologies were used for high-precision structure monitoring of a bridge in Ohio. A drone was flown over Long Arm Dam in Hanover, PA to create a high-resolution orthomosaic and a Digital Terrain Model with 1-ft contours. For more information on how Gannett Fleming is using drones on projects. Use the Contact Form for more information on how you can use our survey team on your project, or provide comments on how we can improve this web site to answer your questions.